People keep asking when we’re going out sailing . . . and there’s always an excuse! Tide is wrong, still fitting out, too much wind, no wind, rig isn’t ready, mainsail isn’t bent on yet, no time to get out/in over the Tidemill bar, we’ve got to be in Derbyshire . . . Is what Rik said proving to be true? ‘Now we will find out if Steve is a boatbuilder or a sailor!’ Or is it Bev, who quite likes pottering around in Woodbridge and the surrounding area? 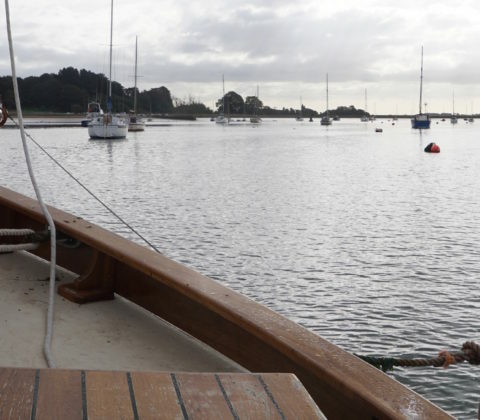 After ten years in the tent and the van, there are lots of reasons for us to just enjoy being on our boat, in the water, doing the ‘fitting out’ and getting her ‘shipshape’. Actually living on her this summer, without needing to have the van as a ‘back up’, has been great! Her interior is really taking shape. We’ve had lots of visitors, and can repay some of the hospitality we’ve had over the past ten years. But, she’s a sailing boat, not just a houseboat, and we have got some lovely new sails. So we check the tides and go for a night out in the river on a calm weekend 28-29 September. Thankyou, Bill, for the loan of your mooring buoy at Ramsholt. On Saturday morning, who did we see but ‘Kestrel’, sailing downriver and surprised to find us out of the Tidemill at last! We needed to be back in the Tidemill to meet Baz on Saturday afternoon to discuss the winter covers, measure up and plan a schedule for getting everything done before the weather turns. Decisions made and schedule agreed, we’re going to bring all the sails home for winter storage and store the gaff and bowsprit on the deck. Bringing the anchor into the forepeak will mean we can have a fully fitted cover fore and aft with zipped doorways both sides of the cockpit, as we’ll want to come down during the winter.